Before you know it, it’s already Thanksgiving. You’ve caught up with family, the dishes have gone around the table, and perhaps you’re dealing with that uncle who always has “one too many.” Then, in the middle of dinner, you feel a slight nudge or a wagging tail from under the table. Looking down at those puppy eyes, you know exactly what your dog is trying to tell you. Dogs beg for things that might not be good for them. They don’t know any better, but you do. Still, it is hard to turn them down. 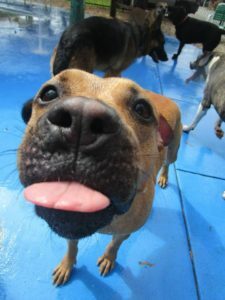 So what are some scraps you can give to your dog? 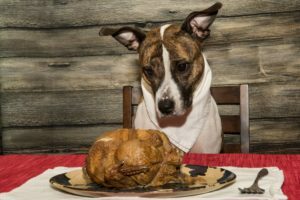 Read below to find out what’s safe and what isn’t for your dog to eat this Thanksgiving. Instinctively, this is the dish that your dog will crave the most. Turkey can actually be a healthy treat for your canine. It’s lean source of animal-based protein. Just make sure that you use white meat, there’s no skin on it, and there’s absolutely no bones. Even after the meal is over, make sure you throw away the turkey carcass somewhere your dog can’t reach. 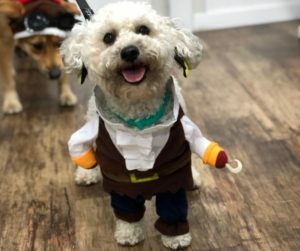 These aren’t just a Thanksgiving treat for dogs. If they’re served naturally, without any added salt, they can be a great snack that’s packed with vitamins. Just make sure you’re not feeding them green bean casserole which contains ingredients that aren’t safe for your dog. Just plain mashed potatoes will be fine with your pet. The only thing you’d have to look out for would be any sour cream or butter that has been added. Also make sure they’re well cooked. Tossing your pooch a dinner roll from the bread basket is perfectly okay. The only types of bread to keep away from your dog include garlic bread and any that contain seeds. If you’re baking, it’s important that you do not let your dog consume any raw dough. In general, dogs shouldn’t eat anything that’s too fatty. This is the same reason why they shouldn’t eat turkey skin or mashed potatoes cooked with dairy. The high concentration of fat in these foods can upset their digestive systems. Basically everyone knows that chocolate is bad for dogs. That shouldn’t really have to be put on this list. However, many don’t know about xylitol which is a sweetener used in many baked goods. This extract is very toxic to canines. Just 3 grams of it can cause liver failure in a 65 pound dog. Sugar itself might alright in small amounts, but it’s just not worth the risk. This basically means no onions, leeks, garlic, or chives. These types of plants are actually poisonous to dogs, causing toxic anemia. Don’t feed your dog any food that might have been cooked with even a little bit of alliums. That means a big “NO” to the stuffing! There is a such thing as “dog beer,” but it doesn’t contain alcohol. Even if they are 21 in dog years, it’s never ok to give them any form of alcohol. Just as with many other foods, it can react very differently in a dog’s body. What we think is just a small taste can give them alcohol poisoning. Thanksgiving marks the beginning of the holiday season. This time of the year is about making enjoyable memories and coming together. You don’t want the one you’re the most thankful for to be hurt in anyway. So although some foods are safe for your dog to eat, you still want to sparingly give them your scraps. Also, you don’t want them to develop the habit of begging. This time of the year is also the busiest for traveling. Many of those we care about might be an entire plane ride away, and bringing your dog along might not be as easy. In this case, or in any situation you’re away, drop your dog off at any of the Love My Dog Resorts & Playgrounds! 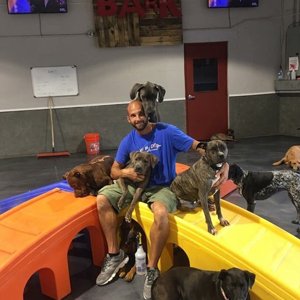 We don’t just take care of your pet, but we make sure they’re having fun and making new friends. We locations in North Pinellas, Downtown St.Pete, and South Tampa. Contact us today about booking a room for your dog.